Who should be #1 in the Tag Team Top 5 for 4/28/14? Winners of the online voting competition are “People’s Champs” for the week AND helps their overall ranking! There is no prize for second place but all votes that come in add to the team’s final ranking so vote away! 1. Melvin Maximus-He did it again! The “Marvelous” OVW TV Champion gets his 3rd #1 in the Indy Power Rankings this week after 3 wins this week, extending his win streak to 34 straight. He defeated Bodyguy & Eddie Diamond in a 3 Way to retain the title on 4/23, teamed with Royal Red and Elvis Pridemore to defeat Leon Shelly, Deonta Davis, & Raul Lamotta on 4/25, and beat Jay Best on 4/26. 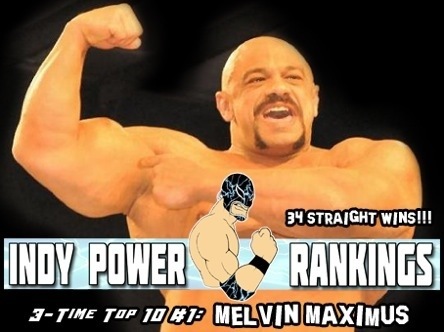 This #1 ranking puts him ahead of Rockstar Spud & Randy Royal for most #1 rankings by an OVW TV Champion. 2. Michael Elgin-The #1 in the 2014 IPR 100 shoots up the Top 10 this week with a little luck from people ahead of him losing and a couple of impressive wins. On 4/25 he defended his AIW Absolute Title successfully vs. Colin Delaney. On 4/27 he defeated Amazing Red at Squared Circle Live. “The Unbreakable” one has now won 4 straight and now that he’s got some momentum going, look the hell out! 3. Uhaa Nation-“The One Man Nation” continued his dominance of Dragon Gate in 2014 over the weekend. Granted, he has yet to be able to reach the #1 spot, but outside of Ricochet, very few have been more successful there. This week he defeated YAMATO, BxB Hulk, & Kzy in a 6 Man Tag on 4/26 and then Kotoka on 4/27. He has won 18 of his last 21 matches and has a 29-13 record in 2014. Now that he’s this high in the rankings, his best opportunities to get a #1 ranking are coming up. 4. Martin Kirby-He’s been seen before on the Tag Team Top 5 ballot, but this week he teamed with Kris Travis to defeat Mark Haskins & Petey Williams at SWE Risky Business 3 on 4/26, and then beat Dean Allmark to advance to the Speed King 2014 Tournament finals where he defeated AR Fox, Kay Lee Ray, Pete Dunne, Robbie X, and Will Ospreay to win the tournament. One magical night gets him a very high ranking and the opportunity to build on that success. 5. 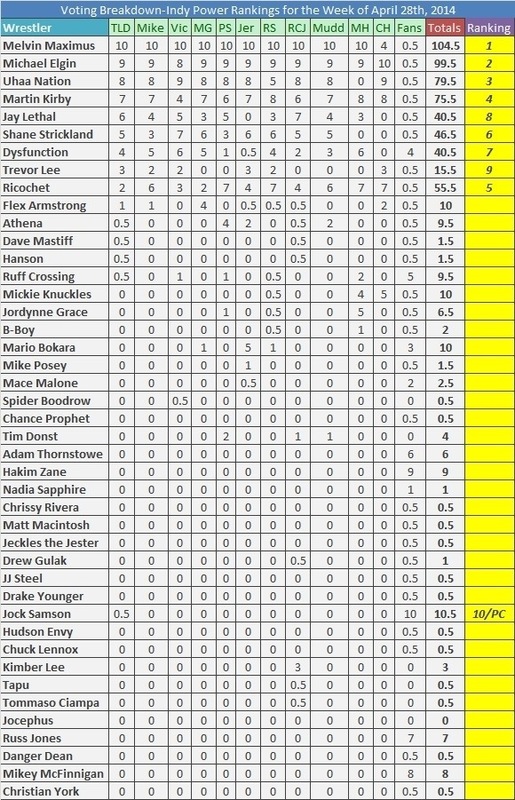 Ricochet-Relatively speaking and comparing what he’s done in previous weeks/months, this is a pretty low ranking for the DGUSA Open the Freedom Gate/Dragon Gate Open the Dream Gate Champion. That being said, it’s still a ranking and something he can build upon. Over the weekend he tagged with Masato Yoshino to defeat Mr. Quu Quu Tanizaki Naoki Toyonaka Dolphin and Jimmy Kanda on 4/26 but lost a 6 Man tag to T-Hawk, Eita, and Flamita on 4/27. He is 20-2 in Japan in 2014 and is 27-7 in his last 34 matches, overall. 6. Shane Strickland-The CZW Wired TV Champion has been getting snubbed off and on for months and FINALLY, he breaks through with a very good weekend. He went 2-0 defeating and ending the win streak of Matt Cross and then retaining the title vs. Joe Gacy on 4/27. With the wins he’s picking up as champion, expect to see him in the Top 10 more frequently in 2014. 8. Jay Lethal-The ROH TV Champion makes another appearance in the Top 10 after a victory vs. Mike Reed on 4/26 at Inspire Pro Wrestling. That match alone was good, but it’s the fact that it’s his 5th straight win that got the attention of the official voters this week. Lethal is on a roll and the rankings are starting to bear that out! 9. Trevor Lee-The CWF Mid-Atlantic Ultra J Champion defeated Adam Page at OMEGA Wrestling on 4/26 to run his win streak to 3 straight. He is another very talented wrestler that has been snubbed more often than not, but those days appear to be at an end. If he can keep this win streak going, he’s going to be someone to look out for in the upcoming weeks and months. 10. Jock Samson-The fans came out in full force for the WAR Champion as they “Jocked the vote” and earned him 157 votes and the “People’s Champ” award for the week after narrowly losing a match to the Honky Tonk Man, but bouncing back with another title defense. He may prefer to be the “People’s Drunk” but either way, it was the people that snuck him into the #10 spot this week. Who should be #1 in the Indy Power Rankings for the Week of 4/28/14? Winner of the online voting competition is “People’s Champ” for the week AND helps his/her overall ranking! 5	Mini Mariachi defeated Pierroth Jr.
Rik Luxury defeats Dylan Drake (c) – TITLE CHANGE !!! Idris Jackson & JR Kratos defeat The Suburban Commandos (D-Unit & T-Rent) and The Westside Bad Boys (Boyce LeGrande & Marquis Jackson) – TITLE CHANGE !! !